I was privledged to get these shots from a Sharp-tailed grouse lek. I gained access through a close friend to a large lek that contained about 40 plus birds. The area wasn't grazed so the grass was tall and made taking pictures somewhat difficult. While access to this lek is limited to avoid disruption of the mating birds, there are many leks, each hosting a small number of birds, wherever there are grouse. 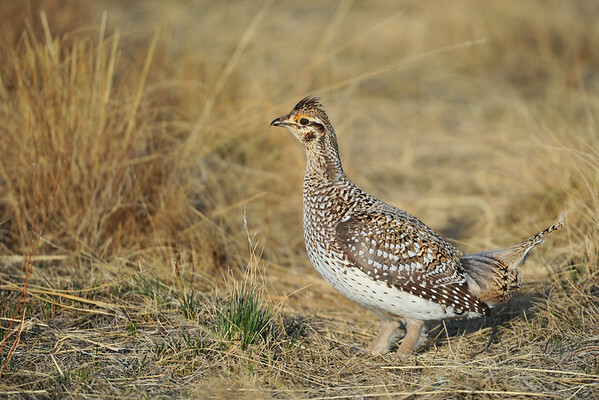 A lek is where one to many males gather to attract, determine dominance and mate with females. The Lek is normally at a traditional site where birds gather daily before and during breeding season, in spring. Individual birds take up the same space with the most dominate at the centre. A lek can exist in the same area for several years. Every morning during the breeding season, the sharp-tailed grouse come to the lek to display, dance and compete for the females. I like his "boots"... great pics!